When it comes to making and serving Creme Brulee, I like to use easy to prepare recipes and this recipe by Tupperware certainly fills that requirement. This easy recipe will take approximately 15 minutes to prepare and will serve 6. In a nonstick pot, heat the cream with the vanilla bean. In Prep Essentials™ Mix-N-Stor® Plus Pitcher beat the sugar, egg yolks until light and creamy. Remove the vanilla bean and strain mixture. Whisk the warm cream, a little at a time, into the egg yolks and sugar. 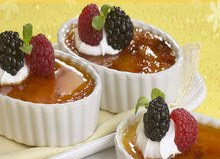 Pour into small custard cups and bake at 350°F in a hot water bath until set. About 20 minutes. Remove from oven, cool and refrigerate. When ready to serve cover cups with brown or granulated sugar and place under broiler until sugar melts and caramelizes. Serve immediately.